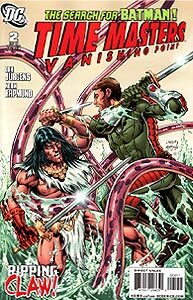 Cover Description: Rip Hunter spars with Claw amidst tentacles. (No Booster Gold.) This is the second Booster Gold comic book in a month to feature tentacles on the cover (see Booster Gold Vol. 2, #35). Brief Synopsis: Booster Gold and son continue their tour through historic moments in the DC Universe. Issue Notes: This mini-series loosely ties-into the "Search for Bruce Wayne" storyline. Issue Reprints: This mini-series has been collected in Time Masters: Vanishing Point. Boosterrific Review: This issue is much superior to the previous issue. This is largely in thanks to the fact that it is further divorced from Batman: The Return of Bruce Wayne. Because Dan Jurgens no longer needs to connect so strongly to Grant Morrison's miniseries, he's able to tell his type of story. (The writing style of the two men are about as different as Claw and Green Lantern: you shouldn't expect to see the two in the same story.) And this is very much a Dan Jurgens story, as time travel mishap provides the excuse to tie together widely disparate parts of DC Universe tapestry into a classic Jurgens' action-packed slugfest. If you like Dan Jurgens, you'll love this issue. Better than the first, and I'm really enjoying these scenes at the beginning showing a fatherly Booster Gold and child Rip. GL does some insulting of Booster Gold, and while that "torment" that Booster must endure is a favorite part of mine about his character, GL better shut his mouth. If it weren't for a retcon, he would still be dead and labeled as a traitorous lunatic. Boosterrific seems VERY convinced that Supernova isn't Daniel Carter. But who could it be? Knowing DC's obsession with Bruce, it'll probably turn out to be him....somehow. This was great. Booster was funny (I loved the line about copyrights) and poignant as the banter with Green Lantern showed. And who knew Daniel Carter had such a good head on his shoulders...wait is that him? A fun issue that offered great insight into Rip and Booster. Understanding! Finally. I've always wondered how getting drowning underwater could take Bruce Wayne to another point in time. It's a good thing I decided to pick up Return of Bruce Wayne in spite of Grant Morrison's dense writing. Great issue, this one. I enjoyed this issue more than last. Jurgens weaves some nice details to the Time Stealers, develops Rip and his relationship with Booster. 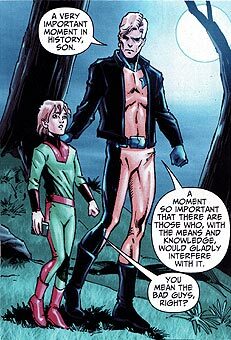 While this is mainly written in Rips' POV we do see Boosters' struggles with trying to balance his instincts as a superhero with what he knows as a Time Master in training. The best part for me was Jurgens showing how Rip grows into the man he is by learning from Booster, and hearing a bit of Boosters' "voice" in Rips' mannerisms.